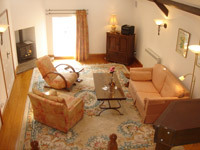 La Pompe is a lovely property offering three cottage style ‘Gites’ which are situated in the lovely parish of St. Martin on the beautiful Island of Guernsey. There is easy access to the beautiful South East cliff walks and pretty bays, village shops (supermarkets, pharmacy and post office) and the bus service to the main town of St. Peter Port or the West Coast. Offering high quality self-catering accommodation, La Pompe Country Apartments are one of only a very few properties to all be graded FIVE STAR. La Pompe aims to assure you of the highest possible standards on the island for self-catering at a traditional Guernsey granite property. Le Pigeonnier (1 x 1m80 or twin beds) and La Cachette (1x 1m80 or twin beds and 1 x 1m50 bed) both en-suite, have the same changeover day and can be booked should a party of up to six wish to stay close together sharing a garden, yet with own privacy and patios. 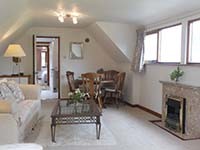 Le Pigeonnier has an extra large double bed (twin available by prior request), bathroom, fully fitted kitchen and very spacious lounge/dining room, with beautiful marble fireplace with attractive coal effect electric fire. La Cachette features an open-plan, fully fitted kitchen with peninsular, a dining area and a comfortable, bright living room leading through double doors to private south and west facing patios with sun loungers, dining table and chairs. La Galerie is a fabulous barn conversion with one large double bed leading into en-suite bathroom with corner bath with shower over. A traditional gallery kitchen and oak dining table overlook the very spacious high beamed living room. 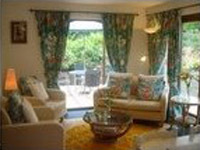 La Pompe Country Apartments - High-quality accommodation in the lovely island of Guernsey.